For me the Camino has been a journey of SYNCHRONICITY – it has been a flow of people, events and experiences all which led to the Camino and Spain. It was a journey I would never have expected or anticipated and continues to unfold each day as I am now living in Lugo, Galicia – Spain. 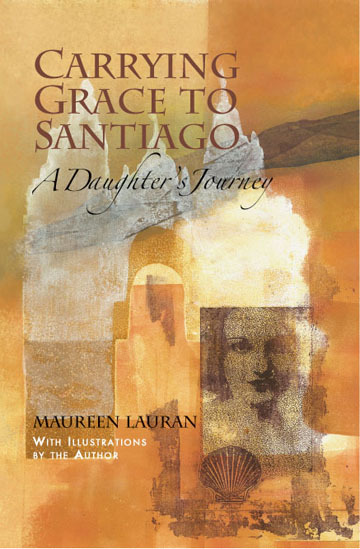 One of the very special Synchronistic experiences was how I was led and became connected with Maureen Lauran December 2010 towards the end of the Xacobeo Holy Year. Through a series of events that were connected over 7 years beginning in 2003 I would be led and guided first to meeting Maureen’s niece Cynthia Lauran who was doing the make up for a television interview where I was to share some of the amazing Camino & Spain Synchronicities – Cynthia would be yet another one in the many years of synchronistic series of events – there is a lot of the story to share which I now transform a Synchronicity TIMELINE of events into book and story form but here are a few related to Maureen Lauran. It was another wonderful surprise to end up at the last minute being interviewed and Cynthia while doing my make up for the show said “So what’s your segment on?” and I said “Holy Pilgrimage Spain” she said “Do you mean the pilgrimage to Santiago de Compostela?. I said “YES”. Cynthia replied “my aunt walked the 500 miles with my grandmother’s ashes on her back. 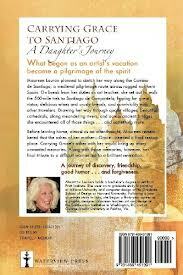 She has painted pictures of the camino and is writing a book you have to meet her!”. Cynthia, working as the make up artist for the show, had been a COLD CALL – a “random” telephone call which led to her working with Dr. Carol Francis and the show Make Life Happen Now. So from 7 years before, 2003, and a random invitation for me to have a glass of wine with a girlfriend at a restaurant in San Diego I had never been to before met a man sitting at the bar reading Filmmaker magazine, David Grober, an inventor and filmmaker from Los Angeles, we would become friends, he would later win and and OSCAR – ACADEMY AWARD for his motion picture stabilization unit and his car would break down 3 1/2 years later in San Diego – I called to offer him help and we hadn’t caught up in awhile he asked what I was doing and I said working on a documentary in Spain and he said I have a famous Spanish Opera singer, Israel Lozano, living in my house you have to meet him before he goes to Vienna to sing with Placido Domingo…. There is much more to the story but now time to write it all down. Thank you for letting me begin to share some the the “SPANISH TRAILS OF SYNCHRONICITY” I have been blessed to experience. Maureen’s story is powerful, inspiring, healing and transforming!!! It is a story that will touch your life in a very special and wonderful way – Thank you Maureen for your beautiful art and inspiring story! Spain to Santiago de Compostela, hoping for great vistas, delicious wines and crusty breads with other travelers. bridges she encountered all of those things . .. . and something more.